Manali provides with a number of hotels and resorts to the visiting guests for a comfortable stay during their trip. Snow Valley resort Manali is one of the popular and reputed hotels of Manali where you can stay on your trip to Manali. It is located in the post area of Manali which is the log hut area. It is sited in pollution free area which is absolutely green. It is perfectly located and is around 1.5 km away from the mall. The resort is sited among the lush green deodar pine forest and is surrounded with apple orchards. 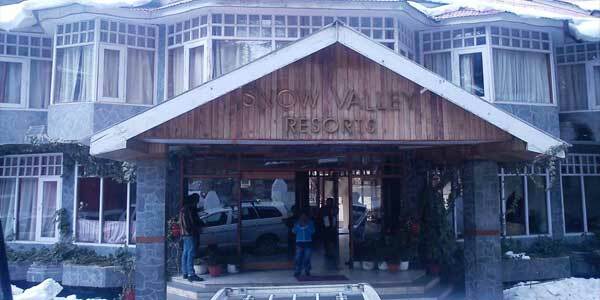 Snow valley resort Manali offers all modern amenities like car rental, travel counter, spacious parking space, purified drinking water, multi channel color television, centrally heated conference hall, free lodging for drivers and many more. Room amenities offered at Snow valley resort Manali are hot and cold water, Pool tables doctor on call, baby sitting, laundry, 24 hour room service and many more. This resort is one of the biggest hotels on Manali having 50 rooms with all high class amenities. All the rooms of this resort are well decorated with local touch. This resort will perfectly fit your budget and at the same time will offer the comforts of home in Manali.